Drugs, Society and Human Behavior provides the latest information on drug use and its effects on society as well as on the individual. 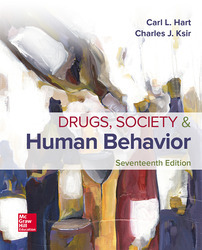 Trusted for more than 40 years by both instructors and students, this authoritative resource examines drugs and drug use from a variety of perspectives—behavioral, pharmacological, historical, social, legal, and clinical. The 17th Edition includes the very latest information and statistics and many new timely topics and issues have been added that are sure to pique students’ interest and stimulate class discussion. Instructors and students can now access their course content through the Connect digital learning platform by purchasing either standalone Connect access or a bundle of print and Connect access. Drugs, Per Se, Are Not Good or Bad How Did We Get Here? How Dangerous Is the Drug? Substance Dependence: What Is It? Which Is More Important, Physical Dependence or Psychological Dependence? Is Addiction Caused by the Substance? Is There an “Addictive Personality”? Is Dependence a Family Disorder? Is Substance Dependence a Disease? Crime and Violence: Does Drug Use Cause Crime? Check Yourself: Are You Hooked on an Activity? Check Yourself: What’s Your Risk of Drug Toxicity? Check Yourself: Do You Have a Drinking Problem? Check Yourself: How Much Caffeine Do You Consume? Check Yourself: Can You Guess What These OTC Products Are Used For? Check Yourself: Do Your Goals and Behaviors Match?